Photo credit - Town of Gladstone. A Lake Manitoba wetland about five times the size of Birds Hill Park called Big Grass Marsh has been donated by the municipalities of Lakeview and Westbourne for conservation, making this the largest such land donation in the province’s history, Conservation and Water Stewardship Minister Gord Mackintosh announced today. This is the largest conservation agreement of its kind in Canada. The two municipalities have signed conservation agreements with the Manitoba Habitat Heritage Corporation that will permanently protect 45,000 acres of wetland and aspen parklands near the south basin of Lake Manitoba. It will continue to be open to hunting and trapping. Permanently protecting this important region will continue to reduce the amount of phosphorous in water heading to Lake Manitoba by about 40 tonnes per year and ensure that it continues to store about three million tonnes of organic carbon, the minister said, adding that is the equivalent of storing a year’s worth of greenhouse-gas emissions from about 2.2 million vehicles. “As more areas become cleared and cultivated, it is important to keep land like this in its natural state and available for grazing," said Reeve Phillip Thordarson, Rural Municipality (RM) of Lakeview. This effort will also support and diversify the local economy as an eco-tourism destination, Minister Mackintosh said. This internationally recognized bird-watching area is a destination of choice for people who come to see thousands of ducks, up to 200,000 geese and numerous sand hill cranes in their natural habitat. 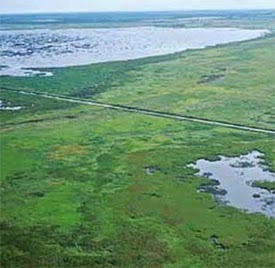 The marsh also holds a significant amount of water from the Whitemud River in the spring and grows significantly during wet periods, which helps reduce flooding. This announcement supports TomorrowNow – Manitoba’s Green Plan, an eight-year plan that supports environmental protection while ensuring a prosperous and environmentally conscious economy.